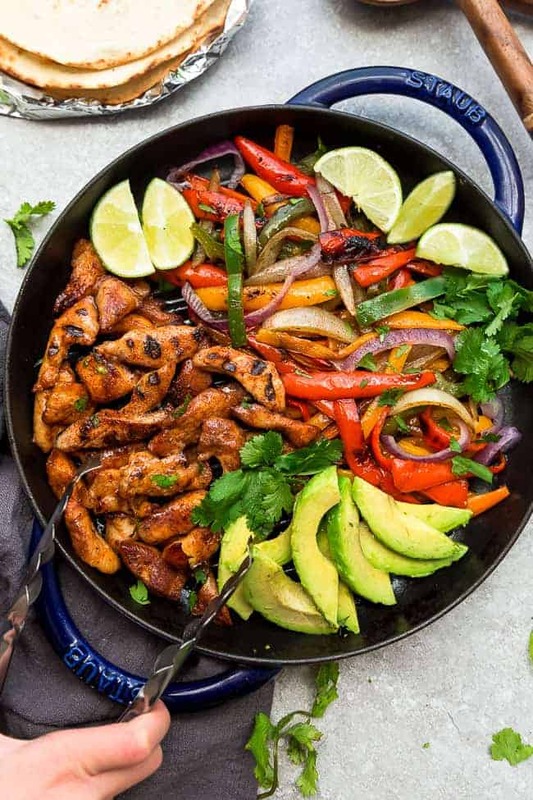 Grilled Chicken Fajitas – the perfect easy and healthy one pan meal for busy weeknights. Best of all, ready in 30 minutes with instructions for the grill or on a skillet. Full of Tex Mex inspired flavors with low carb / keto-friendly options. These easy Low Carb Grilled Chicken Fajitas come together quickly in about 30 minutes and can be made all in one pan or on the grill in about 30 minutes. It’s an easy dinner recipe that you can make anytime you feel like throwing a Mexican fiesta or during a busy weeknight. You’re going to start off by seasoning the chicken with the homemade Tex-Mex inspired seasoning. It’s a blend of chili powder, cumin, smoked paprika, onion powder, garlic powder and salt. Or if you already have a favorite brand of fajita seasoning, you can certainly use that instead to cut down on prep time. Add the chicken to a large zip-top bag and pour in some olive oil and fresh lime juice. Seal and press the bag down so the flavors meld into the chicken. Preheat the grill (or grill pan) to medium-high. Clean grill with brush and grease grates generously with oil to prevent sticking. Add vegetables to a grill tray and cook until softened, stirring often. Place the chicken directly on the grill and cook for 6-8 minutes per side, or until cooked through. WHAT ABOUT FOR SUNDAY MEAL PREP? These Low Carb Chicken Fajitas can also be made ahead of time for meal prep Sunday. 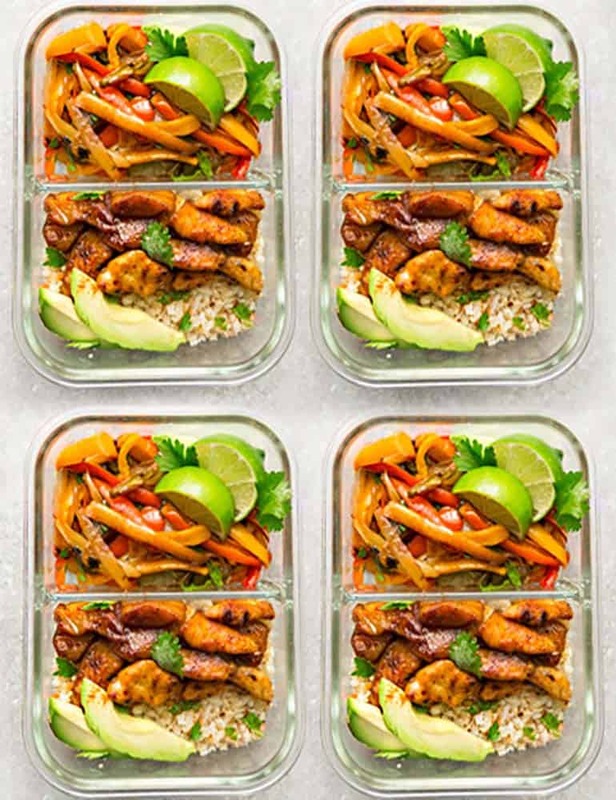 Divide everything out into lunch containers (shown below with cauliflower rice) to enjoy them throughout the week. To keep these grilled chicken fajitas low carb and keto-friendly, serve with low carb tortillas, coconut wraps, as a salad or over some cauliflower rice. 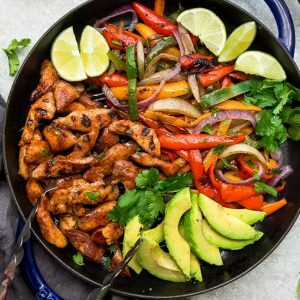 Grilled Chicken Fajitas - the perfect easy and healthy one pan meal for busy weeknights full of Tex Mex flavors. With low carb options. In a resealable small jar, combine all the ingredients for the seasonings. Seal and shake well. Reserve 1 1/2 teaspoons for the bell peppers. In a large resealable bag, combine 2 tablespoons of olive oil, lime juice and 5 teaspoons of the fajita seasonings. Add the chicken to the bag and seal. Press the marinade into the chicken and allow to marinate while you prepare the vegetables (or chill in the refrigerator until ready to use). Preheat the grill (or grill pan) to medium-high heat. Clean grill with brush and grease grates generously with oil to prevent sticking. Place the chicken breasts directly on the preheated grill. Cook chicken for 6-8 minutes per side, or until cooked through. Transfer to a cutting board and cut into 1/4-inch chunks. Serve hot with heated tortillas, avocado slices and lime wedges plus any other toppings of your choice. Serve over some lettuce or cauliflower rice. Divide evenly into lunch containers.